Kerala backwater hotels, travel guides and transport options for the three hub towns of Kerala's backwater region. Kerala has various backwater regions, but the most commonly visited are the waterways and towns of the Alappuzha/Alleppey, Kollam/Quilon and Kottayam districts. The districts derive their names from their 'capital' towns, and this page explores those three backwater towns, giving links to Kerala backwater hotels, transport guides and useful contacts. Alappuzha (Alleppey) is a gateway to Kerala's backwaters, set as it is around a grid of canals. Houseboats, tours and cruises can be booked from this town - it is perhaps the busiest hub for tourism of the region being a popular starting point for explorations into the shimmering waterways just beyond. Arrival/Departure You can reach Alappuzha by road, by boat or by train. The Main Boat Jetty on the North Canal is the usual arrival point by boat, and the coach station is 200m east from the jetty. The train station is 4 kms southwest of the city, and rickshaws to/from here should be inexpensive (R.50-70 or so). Boats to Kottayam leave from the Main Boat Jetty, which is also the arrival/departure point for the cruise to Kollam. Buses can be taken from the KSRTC Bus Stand (near the jetty) to Trivandrum, Kochi, Kottayam and Kumily. If heading to Varkala beach from here, take a Trivandrum bound bus and change at Kollambalam, 7km from Varkala. Kerala Backwater Hotels Alappuzha Palmy Lake Resort About 3 miles from the jetty, cottage accommodation in pleasantly green surroundings. R.700 or thereabouts. Aquainted with Palmy Residency, vey close to the Main Jetty, just north over the footbridge. Budget, clean accommodation. Boat trips can be arranged through either. www.palmyresort.com. Cherukara Nest Homely rooms and bungalows set in a heritage home, prices around R.600-900 non AC and R.1000-2000 AC. www.cherukaranest.com. If you arrive without pre-booking a room, try the area around the Main Boat Jetty (just over the footbridge) for some emergency, budget accommodation. Tourist Information The DTPC Tourist Reception Centre is next to the Main Boat Jetty just beyond to footbridge. On arrival you might want to pick up information and maps from here. Nehru Trophy Snake Boat Race A stunning yearly event in which 30m long 'snake boats' with raised prows and silk flags are raced by local oarsmen. Takes place on Punnamada Lake near Alleppey. 2nd Saturday of August - find information/book tikets ahead of time at any KTDC tourist office. Kollam (Quilon) is on the banks of the Ashtamundi Lake, one of the largest lakes of the backwaters. As with Allapuzha, many river cruises and houseboat trips can be booked from here. Canoe trips (organised by the DTPC, see below) take visitors across the lake and to the canals of Munroe Islnd. Houseboat construction, toddy tapping, coir-making, fishing and traditional village life can be observed on these reasonably priced, informative trips. Arrival/Departure If arriving or departing by boat you will be dropped off/picked up at the Boat Jetty on Jetty Road. Both the DTPC Information Centre and the main KSRTC Bus Stand are next to the jetty, which makes arrival and departure quite straight forward. Boats go to Alleppey (see the Kerala backwater tours page for more info on this service), and across the lake to Guhanandapuram and Perumon (pleasant round trips, 2/4 hours), as well as other local destinations. Ask at the DTPC for further information. Buses are frequent from the KSRTC and go to Alleppey, Trivandrum, Kochi among other towns. Likewise trains are frequent to nearby destinations, with 12 a day going to Kochi! Varkala beach is 30 minutes/R.33 from here by train! The train station is to the east of this small town, near the clock tower. Kerala Backwater Hotels Kollam The DTPC keeps a list of inexpensive homestays available in the area. The Main Road is also good hunting ground for budget accommodation, or rickshaw drivers can often help (though be aware your rate may be slightly higher to cover their commission). Other options if you're spending a little more are the Valiyavilla Family Estate, www.kollamlakeviewresort.com or Nani Hotel on Chinnakada Road (R.1200-3500). We were looking for tickets for the cruise between Kollam and Alappuzha, heading to the DTPC when we were ushered to one side by a tour operater with offices to the left of the jetty. I had used the DTPC before so was a little sceptical, but as it turned out it was the same journey, only with lunch at a resort rather than a chai cafe. Perhaps an extra service due to the popularity of this route. Situated on the Meenachil river, only 16km west of backwater town Kumarakom on the Vembanad Lake, Kottayam is a jump-off point into the backwaters. There are accommodation options here, useful if you organise a houseboat cruise from here, or arrive late, but many opt to stay in Kumarakom. Kumarakom is a beautifully located backwater town - tours through the backwaters here will cost more than from Alappuzha, but the waterways are definitely quieter. On-land accommodation options are mostly high-end, but among best and most magical Kerala backwater hotels. Arrival/Departure A pleasant and inexpensive ferry service runs between Alappuzha and Kottayam (about 2 and a half hours). Boats go from the Kodimatha Jetty (to the south of town) in the summer months - during the monsoon most services leave from the Town Jetty. Kottayam is connected by rail to other backwater towns, as well as to Trivandrum (Kerala's capital) and Ernakulam (for access to Kochi. Kumarakom can be accessed by rail from Kottayam. The KSRTC bus stand in Kottayam is well connected to Keralan towns that include Kumarakom (30 mins), Trivandrum, Alappuzha, Thrissur, Kumily (for access to the Periyar Tiger Sanctuary, Ernakulam and Munnar (for access to Kerala's hill stations). The KSRC bus stand is on T.B. Road, just south of the city centre. Kerala Backwater Hotels Kottayam Kerala backwater hotels can be found in Kottayam and nearby Kumarakom. For Kottayam budget hotels, try in Kodimatha area near the jetty (and bus stand). For a more luxurious stay try centrally located Orchid Residency on Pulimoodu Junction (R.2000). Kanjirakkattu Heritage Home is 1km outside of Kottayam, and prices go from R.1000 upwards. Kerala Backwater Hotels Kumarakom If you decide to stay in Kumarakom and are splashing out, it is worth booking ahead online - the accommadation here is in the 'luxury' catergory. Have a look at www.hotelskumarakom.com for some suggestions. Tourist Information The DTPC Tourist Information Centre in Kottayam is to the south of the city, near the Kodimatha Jetty. Tel. 2560479. If you are looking to explore the mountain range of the Western Ghats (highly recommended!) have a look at our guide to Kerala and Tamil Nadu's hill stations. 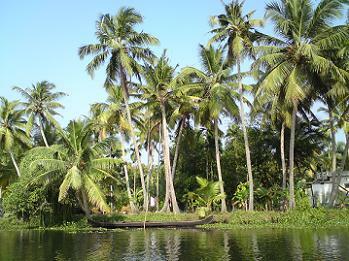 More travel information on the beautiful region of backwater_kerala. Off the beaten track, Wayanad and its Vythiri hills are often regarded as one of Kerala's most stunning destinations. Get cosy by the fire on cold nights, and explore the bizarre mountain town of Ooty on a crisp morning. Perched at over 2,000 metres above sea level, Kodaikanal is an atmospheric and scenically stunning hill station in Tamil Nadu.